Ronald McDonald House Charities of Eastern Wisconsin has a great program for providing aid to local families in need. They call it the Pull Tab Toss program and it is a shining example of community outreach backed up by an impressive logistics system. They strategically place “collection bins”, which look like small houses, in their coverage area where folks can drop off pull tabs from their soda cans. The pull tabs are accumulated in the houses and then sent to the scrap yard where they’re exchanged for money to support Ronald McDonald House charities. We love working with clients, helping to support their brand with our design, fabrication and installation services. 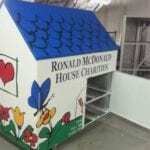 We helped Ronald McDonald House Charities of Eastern Wisconsin by building the pull tab collection house. When I met Jacklyn Wahlberg, their Marketing Coordinator, she described their needs and process, which consisted of tubs, stored in a garage and when full, put in a van and taken to the scrap yard. That’s a lot of work for their volunteers. To get things rolling, Jacklyn gave us a small version of the pull tab collection box (about 5” x 4”) and our design, fabrication and logistics crew took it from there. They were enthusiastic and jumped on board right away! Our design team created several pencil sketches in a very productive brainstorming session. From there Adrian Esguerra developed a formal drawing, which was followed by two more roundtable sessions to determine functionality. Marcus Wichmann helped us think through the connection details, fabrication methods and material thicknesses to make sure the end product would stand up to the rough conditions in the field. 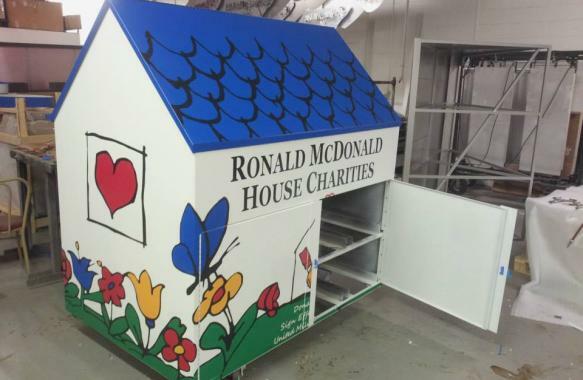 Nick Ortiz painted it and Dino Danielle scheduled the delivery to the Ronald McDonald House on Watertown Plank Road in Milwaukee.